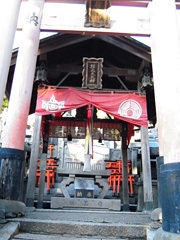 The deity Gondayu Okami is worshiped at this shinseki (site of former shrine, where a deity remains). Behind it you can see a stunning view of the Kyoto city center and the area to the north, close enough to touch. This seems to be the area that was painted as the fifth of the Twelve Views of Inariyama.